Hayatsu Architects was commissioned by RIBA curatorial team to design a proposal for the British Pavilion at the 16th Architecture Biennale Venice 2018. It was a joint bid collaborating with architecture and art practices dRMM, Apparata, Processcraft, and Grizedale Arts. The RIBA-led team was one of four shortlisted finalists. The proposal called for a new kind of civic space in response to the biennale-wide theme of ‘Freespace’. The design was a bricolage of four contemporary projects in the UK; Hastings Pier by dRMM, Manor Park Library by Apparata, The Lookout by Processcraft, and Coniston Mechanics Institute by Grizedale Arts and Hayatsu Architects. 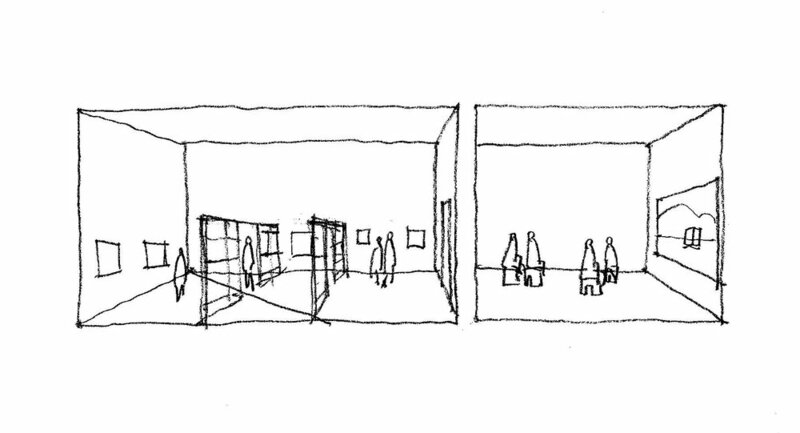 The four projects were to be expressed through material fragments and visual representations to reconfigure the spatial arrangement of the British Pavilion. Situated atop an inclined avenue in the Giardini, the proposal sought to transform the 19th century Palladian architecture into an open and functional space for exhibition and making for visitors and local communities of Venice. Visitors would be welcomed by a 1:3 scale interpretation of Hastings Pier projecting out from the piano noble of the pavilion. The pier’s open deck, much like the original Hastings Pier by dRMM, provides a shaded open undercroft through which the visitors ascend to the main floor of the British Pavilion, which overlooks the surrounding pavilions and the city of Venice beyond. The back of the pavilion is open at the rear terrace and entrance, where the Processcraft’s mirrored faces reflect Venice’s greenery and sky inside the pavilion. Inside, Apparata’s delicate and transparent wooden partition system reconfigures the pavilion to clearly delineating the circulation and studio production spaces where the making of clay tile paving takes place. Visitors are encouraged to participate in the production process by open invitation at any stage. A clear system is arranged throughout the pavilion for participation and display; work benches for the hand pressing of tiles, racks for drying, packing facilities and vertical storage. The tiles produced are a tangible legacy of the project, to be shipped back to the UK to form the ground surface at Coniston Mechanics Institute’s live public realm project ‘The Road’ in the Lake District, Cumbria. 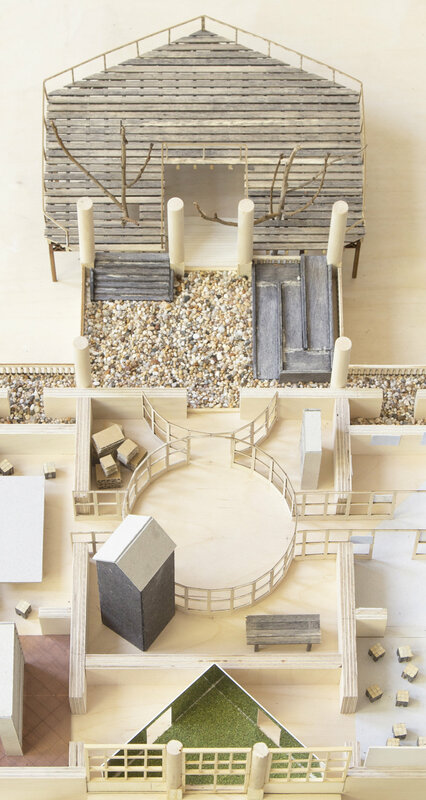 The four projects will also be re-presented experientially through the introduction of site specific floor elements; weathered timber deck, flint stone pebbles, fired terracotta floor tiles, grey linoleum, and moss. Soft and hard floor materials will alternate with the existing conditions to bring some of the sensorial experiences the UK sites in Venice. The RIBA curatorial team’s overall ambition was to explore tangibly the phenomenon within contemporary British architecture which looks to ‘a renewed sensibility and dialogue with current users’, and ‘seeks to base itself upon civic values embodied in the prevailing context.’* The proposal sought to create a transformational spatial arrangement within the existing pavilion and introduce extensive public programming, utilising the RIBA’s strong cultural and educational leadership and Grizedale Arts’ extensive experience of delivering complex participatory community-focused projects internationally.